£10,000, and counting, was raised through a fantastic series of generous donations. 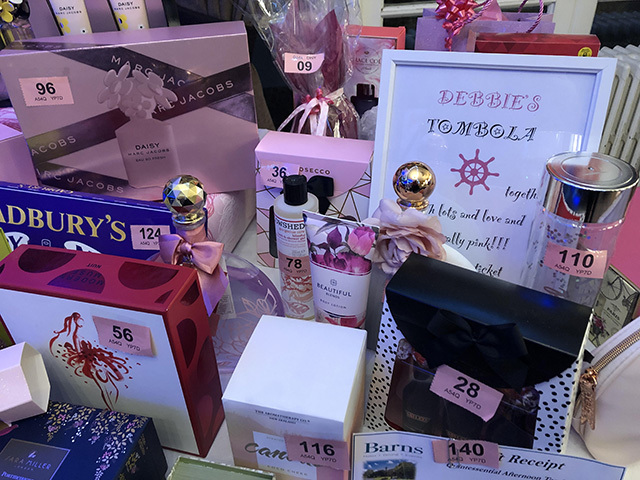 A tombola with proceeds doubled by Barclays Bank, an auction, cruise ship style casino and more, helped to make that up to £10,000+ which, added to £5,000 previously raised by organiser Debbie Burrells and her friends, puts them in sight of their £20,000 target. Debbie was diagnosed with MND last year and since then has used what time she has to rally people to the cause. She has been on national BBC TV, and in local press raising awareness and funds. The cruise ship night was her dream 60th birthday party. Unable to speak at the event because of her worsening condition, Debbie said afterwards via email: “I will always have this picture with me of the amazing night we had. I couldn’t have asked for anything more. As my condition gets worse I will remember all the lovely speeches, and overwhelming kindness of people at the event. “Bedford really does have the best retailers, their generosity was overwhelming, John Medhurst donated a gift voucher and staff at Beales department store were so generous with their donations and gifts." Photo shows Nick and his wife Rebecca as Captains at the cruise event.